Another new die from Die-Versions to share with you. You can catch the whole blog post at the Die-Versions blog here. How cute is this Farm Scene? Paired it with Patterned paper from Lawn Fawn Pink Lemonade and their matching twine. The sentiment is computer generated and trimmed with a fishtail end. As an added bonus with this die, once cut, you end up with a horse silhouette also...cute!!! 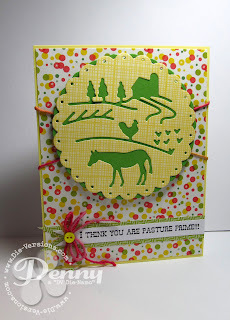 Love the patterned paper behind the tranquil setting.